First Aid Beauty brings the tissues. Hubba hubba! I bought my tub from QVC which is 12 oz and double the size of the regular jar. It’s a lot of product. I like their labeling and how transparent they are. When you open the top, it looks a bit like whipped cream. Colloidal oatmeal is a powerhouse, so that’s a large reason I decided to take the plunge into the FAB universe. I bought it because in the cold weather my hands get hives and eczema. I also take extremely hot showers which leaves my skin extra dry. Normally, I have to reapply whatever lotion I’m using multiple times a day. I have sensitive and easily irritated skin. I’m also a bit obsessive about my skin, which isn’t always a good thing. When I first applied the lotion, the thick consistency was new to me. I rubbed it into my hands and it took only a few seconds to sink it. What I immediately noticed was that it didn’t leave a greasy residue on my palms, which is just heaven. With the amount I’m touching my computer and notebooks, I usually don’t moisturize my palms because I don’t care to grease up everything I touch. But FAB’s Ultra Repair Cream sank right in and I was able to go about my daily business. After my shower, a glob of cream also dissolved effortlessly and left my normally dry back soothed for hours. Moisturizing with FAB’s Ultra Repair Cream has become a post-shower ritual I look forward to. Bonus: it’s safe for your face, and my poor parched face drinks this up. When I apply this at night, I wake up with baby smooth cheeks. This cream is hard to describe, since it’s just a lotion right? Wrong! I’ve never used another lotion that feels as weightless and lasts as long as this does. My skin feels like silk, which is a hard feat to pull off. My hands, which used to be loaded with rough red patches are now calm, even and oh so smooth. They feel silky after 5 minutes and even after 5 hours! I wash my hands a lot, and my skin retains the moisture through washes. Other lotions I would have to reapply- washing my hands would be like stripping it off. 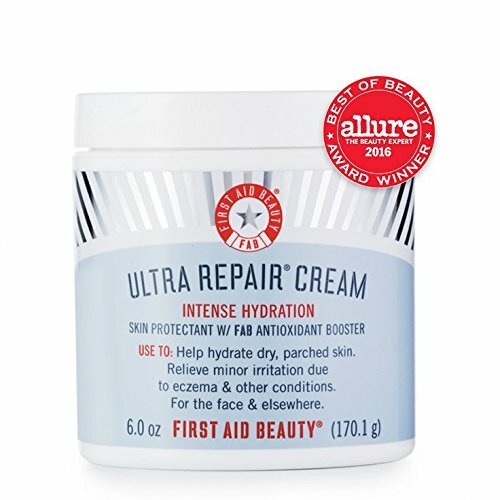 But FAB’s Ultra Repair Cream suctions to your skin and hangs on for dear life, which makes my life enormously easier since I don’t need to remember to moisturize after every hand wash. I think my hands look younger too. You know when you look at someone’s hands when they’re decked out in jewelry but all you can see are their hand wrinkles? This cream obliterates the “old hands” hands. Yes. I already did! I have been using this cream for about 3 months and I’m very attached. I have brand new tubs at the ready when I finish my current tub. I can’t imagine a day without it- I would be so itchy!